Ros Henwood, East Midlands Near Neighbours Project Support Officer tells of her experience working with Near Neighbours for the past 7 months. 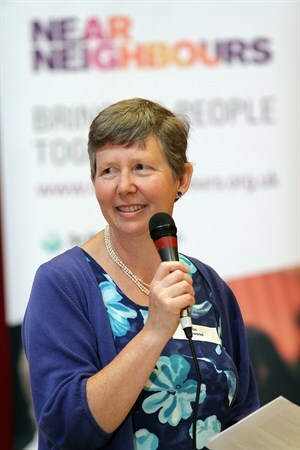 I had heard about Near Neighbours before applying for my role because I was part of setting up Hope Café in our local school – a meeting place for women from different faiths and backgrounds over coffee and cake. Near Neighbours encouraged us early on with a small grant towards table cloths, publicity, toys for the kids and refreshments. I saw the advert for the job of Projects Support Officer for Near Neighbours East Midlands, to cover for John McCallum's sick leave, about 5 days before the deadline for applications. I didn’t have much time to think about it, but posted my form on a Friday in January regardless. I attended an interview the following Monday, and found myself on a train to London for a Near Neighbours Partners’ Day the next morning. Though I couldn’t follow much of what was going on in the meeting, everyone was warm and welcoming, and we had an amazing curry lunch together. After an induction day with Liz and Ali, I started to understand a bit more what the job was about. It’s an amazing job – with so much variety. I’ve organised several big events, with lots of support from a great team at St Philip’s Centre and Near Neighbours, learned how to address a Lord Mayor, discovered excellent local caterers, and how to make a bouquet of balloons. Other coordinators have helped me with keeping track of project applications, encouraged my attempts at Facebook, and generously shared their wisdom and experience. I’m thankful that John was well enough to introduce me to some great people and projects in Nottingham, and to the New Arts Exchange Café in Hyson Green which has been an easy place for meeting people. I’ve learned such a lot of practical wisdom from John's long experience. Certainly the highlight for me has been visiting Near Neighbours projects in Leicester and Nottingham. 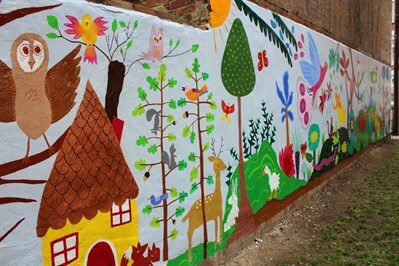 The first project that Near Neighbours funded in Leicester in 2017 was the Onslow Park mural project. I met Penny at the park in May, and saw a long blank wall that was crying out to be made into a mural. The Near Neighbours small grant helped towards paint and brushes, community artists to oversee the project, and of course, refreshments for the painting days and final celebration. Roma, Somali, and Asian children were among those involved in design and painting. The mural is a colourful landscape of animals and bird, trees and flowers. One lad told me the bird he was colouring blue was a chicken (it turned out to be a peacock!. My favourite animal is the very stripey tiger with lots of teeth. The mural, once complete and covered in anti-graffiti protection, has inspired further community activities. A local poet made up a story about the creatures on the mural, and the children ran to point to each animal as it was mentioned. Children wrote stories about the animals in a workshop together. The police are planning to run some games based on the mural one afternoon. It’s put a smile on people who pass by, and is drawing the community around this little park together in such a creative way. It has been satisfying for me to see this one local project through from inception to celebration. It’s been exciting working with groups just at the start of formalising their activities both to include more people, and to make them more sustainable. Seeing the difference a breakfast club makes to asylum seekers, singing along with older folk in Asian languages which make their faces light up, and hearing how football is diverting young lads’ energy away from less sociable activities is so inspiring. And then encouraging new applications from groups – and waiting with anticipation to see how, say, a roller-skating or a cycling project will unfold. One of the highlights this year has been the Great Get Together in memory of Jo Cox MP in June. Near Neighbours gave some small grants towards events organised by Christian, Muslim and Jewish groups in Leicester to show that "we are far more united and have far more in common with each other than that which divides us,"-Jo Cox. I’m pleased to say that John McCallum is now back at work, so I am handing back over to him this week, to carry on the exciting work. It’s been a great 7 months for me, and I hope to continue my connection with Near Neighbours and St Philip’s Centre, though exactly how is as yet unknown. Thanks to all who have made my Near Neighbours experience so rich.